A former high-ranking member of one of New York's Five Families spoke to me of Trump and alleged mob ties. Any journalists/producers seeking sources to do a fair and balanced story on the topic, please contact me. 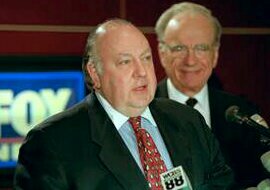 Speaking of which, Roger Ailes, the Republican party's powerful, rotund wingman who created the juggernaut called Fox News, built several successful careers in both television and politics, and apparently even on Broadway, died Thursday at age 77. It was not owing to natural causes. 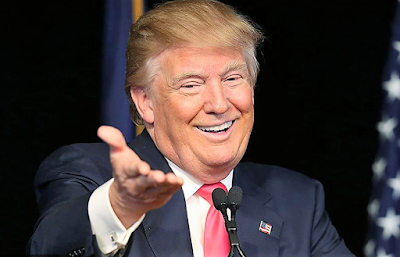 He reportedly took a bad fall at his Palm Beach, Florida home last week, and suffered from a subdural hematoma that put him in a coma from which he never emerged. Ailes "died in disgrace," as one newspaper put it. He began his television career in Cleveland in his home state of Ohio. He grew up the son of a factory foreman father. In the early 1970s, he worked for a conservative news network called Television News Incorporated, funded by brewing magnate (and ultra-conservative) Joseph Coors. Television News Inc. was the blueprint for Fox News. The job allowed Ailes to fathom the complexity of politics in Washington. Soon he became a media consultant and did notable work for the campaigns of Republican presidential candidates Richard Nixon, Ronald Reagan, and George H.W. Bush, among others. Fox News promoted (and continues to promote) Republican candidates and causes, forging for its battle cry the cynical mantra of "fair and balanced." Ailes seized on the perception that the mainstream media and entertainment industry were beset by liberal bias. Ailes didn't create the notion of a liberal media bias, however, which has always loomed in the wings. Rather, he weaponized it. My professors at Hofstra University taught that said "bias" resulted from journalists simply having a much better grasp of the issues than the "common man." Journalists, by profession, are constantly submerged in the latest stories and issues. They engage in ongoing dialogues with the key players, thought leaders and newsmakers while observing daily minutiae -- i.e., the many telling, freely observed details that can't surface in the typical "hard news" format deigning to present an "objective picture." As if objectivity were simply a choice, never mind the troubling, inconvenient philosophical questions it raises. Philosophers going back to ancient civilizations have been telling us, in convincing detail never countered, that true objectivity is impossible. Rather, it's the perception of objectivity, all there really is, that can be crafted, more or less successfully based on the writer's ability. Ailes's plan to differentiate Fox News was to stake its turf way off to the right of the mainstream. His strategy was to relentlessly attack the "liberal bias" of the mainstream media and the entertainment industry. Ruling with an iron fist from behind the scenes, Ailes defied the conventional wisdom that the fledgling network was a dud that CNN would forever dwarf and turned Fox News into a billion-dollar powerhouse of a brand -- the no. 1 cable news network since its inception. He was well compensated for his success and Murdoch granted him unprecedented autonomy. His strategy is finally showing fault lines. (It's been speculated that his last days probably were spent in a state of extreme anger.) Fox has been losing serious ground in ratings lately. The reason? It is not doing the kind of reporting the majority of Americans want to view. Fox isn't investigating the developing President Trump news stories centered on Russia, the FBI, the debate over special prosecutors, etc. For once its key strength has become its key weakness, it'd seem. Networks like CNN, which are doing the deep reporting, are reaping the benefits. When he was abruptly fired last summer, Ailes was at the pinnacle of his career, considered one of the most powerful men in the American media. Gretchen Carlson, a former Fox anchor, had sued him for sexual harassment. Other women came forward to support her claims. She settled a lawsuit with 21st Century Fox, the network's parent, for $20 million, news reports alleged. Analysts said that it was Ailes's "career and influence (that) paved the way for the Trump presidency." Former president George H.W. Bush also credited him with fueling his victory. Ailes pulled off his signature achievement after media mogul Rupert Murdoch hired him to create Fox. Murdoch said of Ailes, "He will be remembered by the many people on both sides of the camera that he discovered, nurtured and promoted." Indeed, quite a few of them won't forget the autocratic television producer anytime soon. He propelled Paula Zahn's career, making the leggy blonde babe a news anchor. And after she left him to helm a primetime slot at CNN, he and his network attacked her relentlessly for years. I love Paula Zahn. I watch her show On the Case, religiously. The Paula Zahn story portrays Ailes as a petty, vindictive, mean-spirited man who should've studied the life and times of one Richard Nixon, former American President. Though the speculation that caused his downfall centered on allegations of sexual harassment, Ailes seemed to feed off his insecurities. He was forever preoccupied with avenging any and all slights, real or imagined. He was definitely Nixonian in temperament. He should've known better. In 2002, as these events were unfolding, the L.A.Times reported: "Ever since Zahn jumped to CNN from Fox News Channel last fall, her former employers have badmouthed her relentlessly. The jibes are sometimes brutal, sometimes humorous and once even profane. The underlying message seems clear: It's not wise to cross Fox News Chairman Roger Ailes. Zahn was host of a prime-time news hour on Fox News Channel last year when CNN weighed in with an offer she couldn't refuse--her own three-hour morning show, reportedly at twice the salary. When Ailes learned of the offer, he fired her. CNN immediately signed Zahn, and the cable channel put her on the air six months earlier than it had expected. That dismissal is an important distinction to Fox. More than a year after it happened, network representatives called Associated Press to complain that a story about Zahn did not say that she had been fired. Ailes set a tone for the post-Zahn era with a comment that quickly became legendary, in part with the help of Fox's on-air personalities. In an article about Zahn's firing, he minimized how she had improved ratings in her time slot while at Fox News Channel. "I could have put a dead raccoon on the air this year and got a better rating than last year," Ailes told the New York Times. "That's all just the growth of our network. All our shows are up." Subsequently, the "Fox & Friends" anchors talked about Zahn on the air with a stuffed raccoon toy on the table in front of them. Fox anchor Steve Doocy, cameras in tow, presented Zahn a gift basket that included the stuffed raccoon after the new studio opened. Ailes sued Zahn's agents, claiming breach of contract. A New York State Supreme Court judge dismissed the complaint in March. "From the very beginning, this was a case of sour grapes by Roger Ailes," Zahn said at the time. "I am glad the judge saw it for what it was and dismissed the suit as meritless." In the last year, Zahn's "Fox & Friends" rivals have been her most frequent needlers. In January, disc jockey Mancow, a "Fox & Friends" contributor, called Zahn a "knucklehead." Because she's the enemy, he said, "I just want to punch her in the face." Two months later, Mancow performed an on-air skit with an actor he said was portraying Zahn. He hit the actor in the face, knocked him down and shouted, "I'll kill you, Paula. We will kill you, Paula." "That was great," anchor Brian Kilmeade said, although co-anchor E.D. Hill urged Mancow to stop as he kept pounding away. Hill has said that Zahn is host of a "bad program, but she's a nice woman."